The sub-10 lakh sedan market has been dominated by Swift Dzire at the lower end and Honda City at the higher end for a very long time. DZire continues to trump its rivals in the Rs. 5-7 lakh price bracket. And, till just 6 months back, City was the undisputed leader in the Rs. 7-10 lakh segment. Unsurprising then, these two cars hold their values best. So a three-year old Dzire LDI with 30,000 km on the meter should fetch you Rs 4.15 lakh in the used car market. The new one costs roughly Rs 6.37 lakh on road in Delhi. That means it looses only Rs 2.22 lakh or about 35% percent of its value in three years. 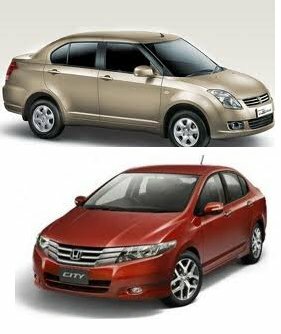 Honda City lose out the crown to Dzire by just a percentage point. A three-year old Honda City 1.5 MT with 30,000 km on the meter should fetch you Rs 5.8 lakh in the used car market. The new one costs roughly Rs 9.10 lakh on road in Delhi. That’s a depreciation of just 36 percent. But things get a bit unpredictable after this. Logan comes in third despite the not so very impressive sales number. A tribute, perhaps, to its solid build quality. Logan 1.5 DLS will get you Rs 3.86 lakh while the new one will cost Rs 6.83 lakh. That is a depreciation of 43 percent. While there were six cars on our hatchback list of cars with sub-40 percent resale value, this list has just two. Most cars here tend loose nearly half their values. That would suggest that there aren’t that many strong contenders in this segment. A glance down the list affirms that. Chevrolet Aveo or the earlier Hyundai Verna hardly set the sales charts on fire. And Fiat Linea, despite being a good car, has suffered for other reasons (Read why Fiat Linea sales are dipping). Tata cars are known to loose value sharply because of issues with their build quality. But things could look quite different in a year or so from now. The new Fluidic Verna is a big improvement on the previous one and there is a strong Volkswagen entry in the form of Vento. Both are too new to make this list (below) as is the new Ford Fiesta.